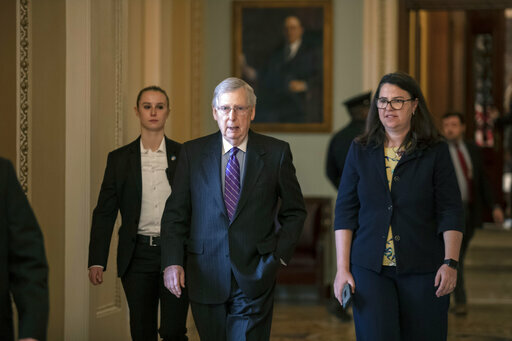 By Louis Jacobson on Wednesday, January 23rd, 2019 at 3:20 p.m.
A pair of votes are scheduled in the Senate for Jan. 24 — either of which could end the partial government shutdown after nearly five weeks. But what are in these two measures, one from the Republicans and the other from Democrats? And is there any likelihood of passage? What’s in the Republican bill? The Republican bill (technically an amendment) draws heavily from a proposal that President Donald Trump made in a speech on Jan. 19. • Providing $5.7 billion for a border wall, Trump’s highest-profile ask. • Three years of provisional protected presence for 700,000 foreign nationals, called "Dreamers," who were brought to the United States as children and who are currently enrolled in the Deferred Action for Childhood Arrivals, or DACA, program. Supporters see this provision as modeling the Bridge Act, a bipartisan bill from the previous Congress that was never passed, but some critics have said it isn't as generous. • Three more years of protection for 300,000 persons with Temporary Protected Status, a temporary benefit for people from countries where it has been determined that a return would be unsafe. • Changes to the asylum process. Currently, immigrants cannot apply for asylum outside the United States. They must apply for the protection once they are in the United States and can do so whether they arrived legally or illegally. The proposal says that children under 18 years old from El Salvador, Guatemala and Honduras who want to apply for asylum must do so outside of the United States at a designated application processing center in Central America. They must also meet other criteria, including having a "qualified parent or guardian" in the United States who can take them into their custody. Beyond these key immigration provisions, the measure would approve funding for the remainder of fiscal year 2019 for the departments and agencies that have not been funded yet, including the departments of Agriculture, Commerce, Homeland Security, Housing and Urban Development, Interior, Justice, State, and a raft of independent agencies. In addition, the bill would include $12.7 billion in supplemental disaster funding for regions hit by hurricanes, wildfires, earthquakes, and volcanic eruptions. What about the Democratic bill? The Democratic bill does not include the wall money, nor does it include the three big changes to immigration policy that are in the Republican measure. And their funding provisions would not cover the remainder of the fiscal year. Rather, the Democratic bill would offer an extension of government funding for the departments and agencies that are currently shuttered, plus supplemental disaster funding. That funding would run out in about two weeks, on Feb. 8. The idea behind the proposal is that lawmakers and the president would use the two extra weeks of normal government operations to forge an agreement on the trickier immigration questions. When will the votes take place? Cloture votes have been scheduled in the Senate for 2:30 p.m. on Jan. 24. A cloture vote is a procedural votes that needs 60 votes to pass. If it receives the 60 votes, debate commences on the bill itself. If it fails to receive 60 votes, debate and a final vote don’t happen. The Republican bill will get a cloture vote first. If it doesn’t get 60 votes, the Democratic measure will get a cloture vote. Does either bill have a chance of passage? Barring a sudden change in the dynamics, it seems unlikely that either bill will get the 60 votes needed. Democrats would need 13 Republican votes, and Republicans would need seven Democratic votes. Why do Republicans dislike the Democratic approach? The Democratic proposal is similar to one that senators of both parties unanimously backed early on, when they thought that Trump would sign it. Then Trump backed off, and since then, he’s said he won’t consent to reopening the government unless he gets $5.7 billion for the border wall. Congressional Republicans so far haven’t opposed his position. Why do Democrats dislike the Republican approach? In the longer term, Democrats say that Trump is effectively holding government workers hostage, and by allowing Trump to win, it will only encourage more "hostage-taking." Democrats have opposed funding for a wall as impractical, immoral or both. As for the specific Senate Republican proposal on the table, Democrats see little benefit from the temporary DACA changes. Democrats gained an even stronger hand for that position when the Supreme Court said on Jan. 22 that it would not review the program in the current annual term. Since lower courts have so far kept DACA in place despite Trump’s efforts to shut it down, that effectively means DACA will continue through at least early 2020. That makes Trump’s proposal less of a concession. Democrats also oppose the asylum changes. They say that such issues should be negotiated as part of a broader immigration agreement. So why pursue this strategy in the Senate? The main benefit is that it puts both all senators on the record. The chamber had not taken any recorded votes since the shutdown began. Once senators have made their views known on the current proposals — and assuming both proposals fail — they can move forward in negotiations. What is happening in the House? So far, the House has been passing bills to re-start government spending that do not include Trump’s desired $5.7 billion for the wall. The president and his allies in the GOP have so far considered this approach a non-starter. Democrats have floated the idea of spending as much as Trump’s $5.7 billion, but on border security more broadly, not for a wall. This offer had not been formalized in a proposal by early afternoon on Jan. 23. But even if it had been, it was not clear that it could break the logjam.